Back Row (l-r): Gary Bliss, Ryon Carney, Brandi Cole, Mandy Ball, Cody Bell, Adrian Hurtado, Nicole Catmull, Amanda West; Middle Row: Ms Robin Anderson, Emily Neibaur, Skyler Spidell, Michael Hollis, Robyn Olson, Beau Twiss, Logan Schenk, Adrian Rios, Max Bailey; Front Row: Scott Torix, Genevive Olivas, Josh Kraus, Candace Ingram, Shane Hossfeld, Jeri Lynn Parks, Desirae Paoli, Jimmy McCray. I ran into Robin Anderson one day and told her I was missing some of my photos from elementary school and asked if she had a copy I might get a copy. She indicated she had a scrapbook full of all the years she taught. She said she would see if she could find it and let me take a copy of the photo. I wasn’t in when she dropped by but she left the book. I took my time going through it and scanned not only my 4th grade picture but a few others. This is one of them. This was my grade, but she apparently taught second grade that year, so these are all my classmates. 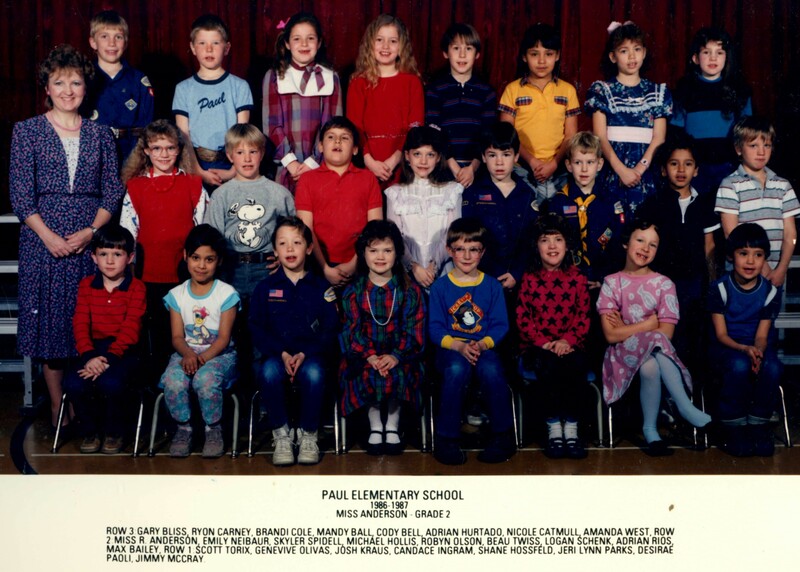 This is a 2nd grade class picture for some of my classmates at Paul Elementary, Paul, Idaho. 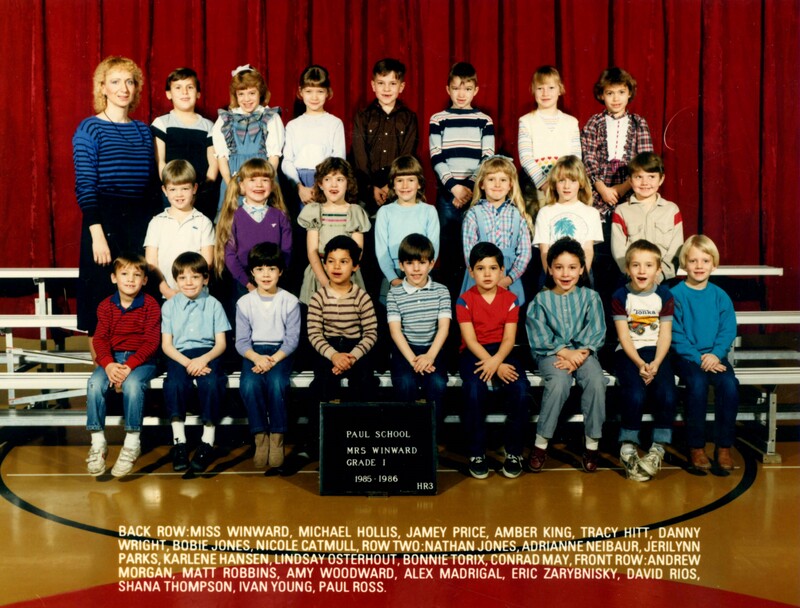 This was the 1986 – 1987 school year.